I was invited to join the Poetry Army as its Choral Director, bringing in choirs from across the UK, including Sheffield Socialist Choir and Red Leicester Choir. Written by Heathcote Williams Poetry Can F**k Off was a celebration of the power of poetry, the voice it can lend to people facing injustice and oppression. It highlighted the works of poets and orators from Emily Dickinson to Gil Scott-Heron, Gandi to Pussie Riot. My part in the celebrations was to direct the choirs who performed Leon Rosselson’s arrangement of James Oppenheim’s poem Bread and Roses. Click here for a review of the Brighton performance. See below for the Poetry Army Trailer. 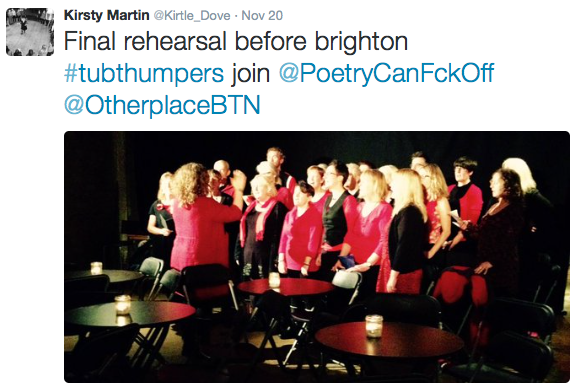 Brighton Tubthumpers was invited to take part in a Poetry Army performance of a Heathcote Williams‘ poem. We sang Bread & Roses. this was the first performance for Brighton Tubthumpers and it was well received. Here is a review from Michael Kemp – read to the bottom for his praise of the choir’s contribution. 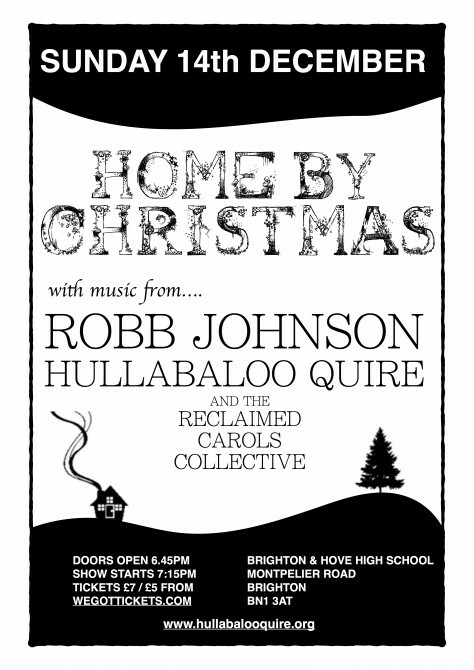 In Autumn 2014 – my raggle tangle group of choral troubadours Hullabaloo Community Quire worked with folk rock protest singer Robb Johnson! The project culminated in a joint performance. I am currently working with Robb to put together another project, this time with Brighton Tubthumpers! Summer 2014, I ran a fantastic project called Daily Choir at the very wonderful Wickham Festival. With the support of Festival Boss Peter Chegwyn, we put together an exciting collaboration with Brighton Radi-Belle Naomi Bedford and her folk rock legend comrade Paul Simmonds. Working in cahoots with Naomi, we decided on a few of her songs for me to arrange into glorious harmony for the Wickham warblers, and I got to work. The Daily Choir was a roaring success – we had three sessions with about 40 festival going singers, learning the songs ‘Raise these sails’ and ‘Gypsy Davy’ – both songs on Naomi’s new album ‘A History of Insolence’. The Daily Choir then joined forces with Naomi and Paul for a small but perfectly formed gig to kick start the last day’s music at Wickham. Great fun! I have been invited back to run Daily Choir next year, so if you are heading to Wickham – see you there! Naomi, Paul and I are making plans to work together next year – more details coming soon! Hullabaloo Community Choir collaborated with Canadian band Po’ Girl. The Moulettes are a folk rock band. Hullabaloo collaborated with them. The gig at the end of the project rocked!